Sky, Coca-Cola and Indesit are among C&IT's pick of corporate events in 2009. Johnson & Johnson chose the Royal Institute of British Architects (Riba) for its awards ceremony in January. Nutricia appointed Grass Roots Eventcom and Grass Roots Live to produce its conference and incentive at the Evian Royal Resort, France in February. Henri Wintermans chose Intercontinental Paris Le Grand for its Cafe Creme Express product launch and incentive in February. Indesit's independent retailer product launch in London used Evolution, Battersea Park, the May Fair Hotel and the Oxo Tower in March and April. Wella Professionals rewarded Sassoon team members with an exotic and memorable experience at Oman venues in April. Web marketer Specific Media appointed Sportsworld to deliver its corporate hospitality event during the British Lions tour to South Africa in June. Coca-Cola briefed agency Altyerre to deliver a team day in London for the soft-drink manufacturer's executives that would combine fun, CSR and its sponsorship of the 2012 Games in June. 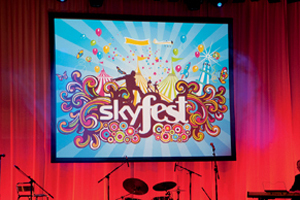 Media giant Sky hosted Skyfest in London in July to engage and reward its staff across all of its divisions. Welsh brewing firm SA Brain & Co held its company conference at Cardiff's Swalec Stadium in July. Food retailer Iceland chose Disney World Florida for its £4m annual conference and incentive for store managers in September/October.